I started Togetherness Tuesdays Drop In Group Coaching a month ago. My intention was to create an affordable option for those who want on-going coaching. It's $65 per month for a 1-hour call happens every Tuesday from 2 - 3 pm central. That's 4 - 5 calls per month so $13 - $16 per call. Crazy high value coaching deal. The idea has been rolling around in my heart + mind for so long and I hoped it would be well received. What's come out of our time together in just a month has been nothing short of miraculous. It's clear that what's happening is less a drop-in call and more a tribe. A community is forming and I find myself leaving each call with full body chills and feelings of WOAH that was g-o-o-d! "I'm excited by how many veggies are in my life now!" "Like you say it is spot coaching ... everyone gets what they need in that moment. We have seen some really profound break-thru's! C deciding that life is too short to not have the life she deserves. K learning to lovingly stand up to her family about raising her son. Both of those instances gave me chills! I have found that when I come into the call with something big bothering me we can talk it out and break it down into something small and manageable. I leave with an entirely different perspective. Love that!!! And, no matter what someone's issue is, at the base of it all is always to take care of ourselves ... primary food, secondary food, physical activity, sunshine. All the things that make us whole and happy." "The idea of who do I want to be in this moment has stayed with me. I am so empowered that I get to choose!" "I get new energy + inspiration when I talk to you. Thank you, Lacy!" This is a come as you are, all hearts welcome kinda group. It's a share as much or as little as you want, this is a safe place kinda place. It's an opportunity to pause. There are 10,080 minutes in a week. This is the place where you set aside 60 of them just for you. To show up, be seen, listen, share, receive, grow + transform. This is a place to say that you're ready to see yourself with love. To embody the beauty that you are. To add in healthy practices (like green juice)! To release the extra weight (both physical + emotional). Togetherness Tuesday is where you become conscious to compassion. To enthusiasm. To possibility. If you're in need of regular + real support this is your tribe. I share practical tools and a whole lot of love. You'll gain knowledge + awareness. Sometimes we talk food. Sometimes we talk life, love, stress, children, marriage, work, play +++. What kind of life do you want to create? What kinds of food do you want to fuel your body? What do you want your grocery cart + your heart to be full of? This is the place where you will grow. Where you will learn to truly listen to your internal compass and make the decisions that are best for your life + body. If you're ready to expand your repertoire + remember that you're not alone in this journey please join us for Togetherness Tuesday! I believe in Togetherness. I believe that uncertainty is really possibility! I believe in the power of what we can create together. Read more about Togetherness Tuesday + enroll here. STOP! STOP! I interrupted her. WRITE THAT DOWN RIGHT NOW! Holy crap, yes! YES! She'd been eating out of longing for LOVE. She wasn't truly hungry for food. It was a pure, beautiful moment. That message came to her via a brownie. It didn't taste like what she hoped. And it didn't satisfy the hunger. While we were still on the phone she dumped her "candy closet" into the trash bin once and for all. The work we do on food is about so much more than what you eat. I can tell you to eat something green, drink more water and get plenty of sleep but you already know all that stuff. The magic is connecting all the parts of your life that nourish or deplete you. The magic is in shining a light into those dark corners and saying out loud OMG I NEED LOVE NOT A BROWNIE! And then working together on ways to infuse more love into your life! These are the moments that light me up from the inside and leave me floating after I hang up the phone. Does this sound like you? Are you ready to illuminate your life and infuse it with love + healthy foods? Consider joining us for the next Group Health Coaching session! This group is small, intimate, supportive and loving. Do you want to be reminded that you’re not alone? Do you want to lose weight? Gain confidence? Do you want to feel healthy? Do you feel overwhelmed by all the contradictory diets out there? Are you tired all the time + want to get your spark back? Does balance feel unattainable? Or perhaps it’s just within your reach but you could use a boost! Are you ready to change your relationship with food? In 3 months you will learn the Foundations of Food and receive the tools and support to change your relationship with food. The process is gentle and supportive. You’ll find what foods work best to achieve your goals and support your body. The groups are intentionally small and you can share as much or as little as you’d like. In addition, you’ll also receive a 1:1 coaching session with me. We talk every other week for one hour from 12 - 1 PST OR 6pm-7pm PST There will be two groups running this round. Please say which time you're joining. Before I begin anything new I always ask myself… what will it cost me to participate? and what will it cost me not to?! Your time is now! Sign up here or fill out a confidential health history + schedule a free call to talk about your health concerns and goals to see if the group is a good fit for you. P.S. Listening to this on repeat. I loved this movie. LOVED it. We're fast tracking it to summer and now is the perfect time to begin (or happily continue) your journey to whole health + happiness. I'd love for you to join us for Group Health Coaching! Do you want to be reminded that you're not alone? Do you want to lose weight? Gain confidence? Do you feel overwhelmed by all the contradictory diets out there? Are you tired all the time + want to get your spark back? Does balance feel unattainable? Or perhaps it's just within your reach but you could use a boost! Are you ready to change your relationship with food? In 3 months you will learn the Foundations of Food and receive the tools and support to change your relationship with food. The process is gentle and supportive. You'll find what foods work best to achieve your goals and support your body. The groups are intentionally small and you can share as much or as little as you’d like. Before I begin anything new I always ask myself... what will it cost me to participate? and what will it cost me not to?! Your time is now! Sign up here or fill out a confidential health history + schedule a free call to talk about your health concerns and goals to see if the group is a good fit for you. Inquiring minds want to know... answering a few questions from FB this week. Stephanie, Generally speaking regarding kidneys my absolute favorite way to introduce healing foods is through juice! It's delicious, concentrated nutrition that is easy to absorb and digest. Kidneys need plenty of water and water rich foods. Watermelon is the kidneys good friend! If you drink caffeine and/or alcohol make sure to drink a full glass of water for every drink that contains caffeine/ alcohol as those two alter kidney function. You’re much more likely to stick to your gym routine if you have a gym buddy, right? The same is true with group coaching. When individuals are part of a group, they procrastinate less, accomplish more, and reach their goals faster. You’ll brainstorm solutions, open creativity channels, and uncover opportunities you may not have discovered working solo. Have you ever been in a study group where you’ve learned from a classmate who gets it? Other group members help you master new concepts like a pro! When you work alone, you examine situations from one perspective – yours. But when you work in a group, you’re exposed to a variety of insights that empower you to see a situation from multiple angles and motivate you to develop new solutions. Ever get a precious nugget of advice from a really honest friend that you just couldn’t see on your own? It’s like that. When you work in a group, the whole team celebrates your success. Just like when a hockey player scores a goal, resulting in a win for the entire team. In this case, no ice skates are required! It’s more fun to go out to dinner with friends than by yourself, right? Working with a group is a social event that participants look forward to. You’ll join a close-knit group that is energizing, motivating and most of all – fun! Group members often become friends. We love this work! We are passionate about what we do and have developed an amazing curriculum with proven happy results. Lisa's recipes are not only completely gorgeous but easy to follow with simple, widely accessible ingredients. We've collaborated with many people through the years and never have we experienced such a mutually energizing and easy flowing co-work life! Happy coaches = happy students! We've never met anyone who didn't like swag! Our support boxes are filled with thoughtfully selected products to enhance your journey. You are very likely to find your new favorite _____ in there! 10. Time is on your side! The class start date has been moved from May 15 to May 29th so you still have time to sign up and join us! Whatcha doing tomorrow night? I'd love for you to join us for Group Health Coaching! 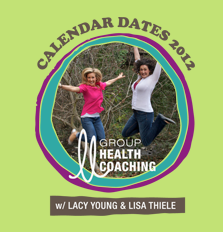 Lisa and I are so excited to bring you the second installment of Group Health Coaching on going deeper with your relationship with self. We'll be covering food, life and all things good. We will be exploring hopefully your very favorite topic YOU! And if YOU don't make your list of favorite topics then get your clicking finger ready and click on over to join us! Class is every other Tuesday night from 6-7 PST and starts tomorrow night and goes for 6 sessions. Invest in you. Take advantage of our killer 2012 pricing of $299 for the series. Become part of a group of like minded women. Get ready to laugh, cry, have fun and change your life! We have a call every other week. It's very much a conversation geared towards health and well being. This session (titled Level 2) we'll be covering everything from food and your relationship with it to portion size and what that really means to you. We will explore topics like Ayurveda, mindful eating, love languages and so much more. Hopefully I'll talk to you tomorrow! Level 1 is changing your relationship with food for the better by establishing a foundation of healthy eating and introducing new foods. Level 2 is focused on deepening the relationship with self in relation to food both primary and secondary. Courses are designed so that they DO NOT have to be taken in order of level1/ level2. You are welcome to take Level 2 without having taken Level 1.